Siemens and BMW have entered the wireless electric vehicle charging market with their version of inductive technology. The two firms launched their non-contact charging station at manufacturing fair Hannover Messe last week in advance of a government-funded trial scheme in Berlin planned for June this year. 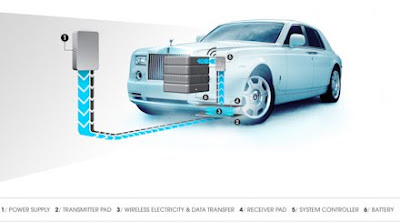 Inductive charging allows motorists to recharge their electric vehicles’ batteries just by parking their car over the wireless station, making the process quicker and simple, and reducing the changes of wear and tear or damage from vandalism. Halo IPT, a spin-out from Auckland University, became the first company to launch commercial wireless vehicle technology in November 2011 following more than a decade of trials. Siemens now intends to test its own 3.6kW charging technology in an electric vehicle to determine what improvements would be needed to integrate the system into series-produced vehicles under real-life conditions. ‘A big obstacle to the expansion of electric mobility is the lack of an extensive and reliable charging infrastructure,’ Siemens said in a statement. ‘Because electric cars have to recharge their batteries more often than vehicles with combustion engines need to refuel, various charging techniques are required that are adapted to the needs of the drivers and vehicles. The charging stations are connected to the public grid by an underground primary coil. A secondary coil is attached to the car and when the driver starts the charging process, an electric current begins to flow through the primary coil. The resulting magnetic field induces an electric current in the secondary coil, which recharges the battery. Electricity is transmitted from the grid through all of the components to the battery at an efficiency of more than 90 per cent. The magnetic field is generated only in an exactly predetermined area between the two coils, which are typically between 8cm and 15cm apart. The system therefore generates a magnetic field whose strength in and around the vehicle is far below the internationally recommended limit of 6.25 microteslas. The system could also enable the car to serve as a storage unit where most of the energy it uses is surplus electricity from solar- and wind-power facilities.